When your baby is around six months old, you may notice that your generally happy child becomes fussy and irritable. 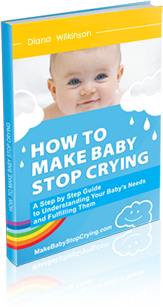 “My baby won’t stop crying!” you think. “What on earth could be the problem?” After some investigation, you find a couple of bumps along your baby’s gums, usually at the front of the bottom jaw. The explanation is simple enough: your baby has started teething. But soothing crying baby who is teething is a trickier matter. Teething is a painful experience for babies and they are probably going to cry and fuss as their new teeth break the gums, but here are some suggestions for how to make babies stop crying and make teething more bearable for them. You can also give your baby snacks, if he or she is already eating solid foods. Try something that they can chew on for a long while, like a vegetable (cucumbers and carrots often work). Here again, you can chill these snacks to provide some cool relief on the gums. If you are going to do this, however, make sure your baby is someplace where you can keep a careful eye on them, as babies can choke on these kinds of foods. You will find that your baby starts to drool a lot as they begin teething. This is normal, but it can also be part of the problem. As with any excessive moisture, the drool could make the skin around their mouth irritated and tender. Stock up on clean, soft cloths and keep them nearby for wiping. As a last resort if your child is in a lot of teething pain, you can give them babies’ acetaminophen or ibuprofen. Make sure to follow the dosage instructions given by the manufacturer, and don’t give them anything with “benzocaine” on the ingredients list. (This has been associated with a rare but serious blood condition.) If you find yourself having to do this on a frequent basis, or if your child also has a fever or diarrhea, then call your pediatrician.